Atwood Ranch is one of the most premier and exclusive properties in the wine country. The family-owned ranch is secluded, which allows it's guests to have the run of the land and really let their imagination run wild. Barns have to be one of my favorite reception backdrops, especially when coupled with long dramatic tables. It is the perfect juxtaposition of design themes. 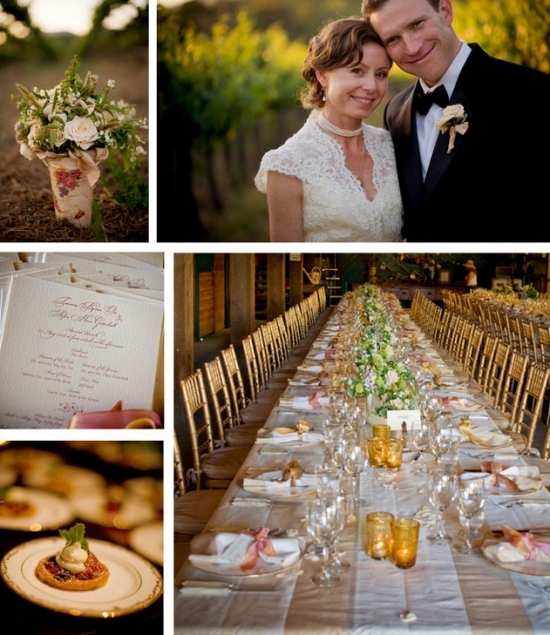 This is a picture perfect design for a venue such as Atwood Ranch. The overall design is simply stunning. Julie Atwood has done an incredible job of balancing refined elegance with many simple rustic touches. For example, the pairing of a formal gold chiavari chair with rustic aged wood containers and the use of vintage inspired china with a simple table linen - these wonderful elements help solidify the elegant feel that the reception has achieved - Perfect! Rosemarie Lion is the perfect person to capture this couple's story. Her style is as natural as the surroundings around them and she does such a wonderful job of capturing their emotions, not just their pictures!